Welcome to G&A Roofing Services, the Roofer in Fulham. We provide professional care to homes and businesses in Fulham and South West London. From odd tile repair to a complete re-roofs, no job is too big or small for our roofer, so call G&A Roofers Fulham today and speak to a real roofer about a new flat roof, chimney repairs, guttering and flat roof repairs. Flat roofs can wear out over time and start to leak. At G&A, we have the answer. We’ll offer you a 20-year guarantee for every new flat roof we supply and fit. Our roofers deal with all types of roofs in Fulham, here are some of the systems our flat roofer can fit including felt roofs, fibreglass flat roofs and rubber flat roofs. Call us today and speak to a real a flat roofer in Fulham. If freezing weather such as snow and ice has caused your gutters to crack and start leaking, our flat roofers can help. We offer gutters maintenance work to keep gutters working well all year round. We provide gutter cleaning, gutter repairs, gutter blockage clearance and replacement down-pipes and guttering. Speak to our flat roofer in Fulham for help today. 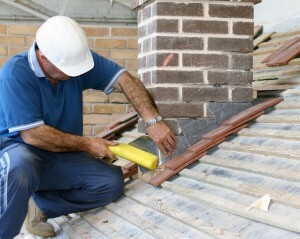 Chimney work is a specialist job and this work should only be undertaken by a competent roofer. As the highest point of your property, chimneys can often start to leak when damaged by strong winds and stormy weather. At G&A, we offer chimney repairs such as chimney rebuilding, re-pointing for brickwork, chimney pot refitting, repairs for lead flashings and chimney removal. Speak to your roofer for help in Fulham today. Fibreglass Roofer Fulham;Fibreglass flat roofs are easy to repair, fit and maintain. They are also called GRP, or Glass Reinforced Polyester. Fibreglass flat roofs are extremely strong and are fire-resistant. With a professional roofer fitting, fibreglass flat roofs can provide excellent cover for your property for many years. Built-Up Felt Roofer Fulham; Built-up bitumen felt roofs, also known as bituminous felt roofing or felt roofing, are popular for balconies, porches, extensions and roof terraces. They provide perfect protection throughout the seasons and are made from two to three layers of durable felt. Felt roofing is thermally efficient, strong and provides lasting cover. G&A will provide a fast response to property owners needing urgent care for their home or business in Fulham. Our team of emergency flat roofers can provide professional care for properties that have suffered storm damage. Our emergency roof repairs services comes highly recommended. Call us for a reliable emergency flat roofer in Fulham today. With over 26 years in the industry G&A have the know how when it comes to emergency roof repairs, our roofers are on standby 7 day a week and are ready for your call, so call us today for a fast a reliable roofer. Contact G&A, and to talk through your requirements with a flat roofer today. Call our friendly team of roofers for advice on Fulham 020 7205 5785. This entry was posted in Flat Roofing and tagged chimney, Emergency, flat, Fulham, repairs, reputable, roofer, roofers, roofing, roofs. Bookmark the permalink.